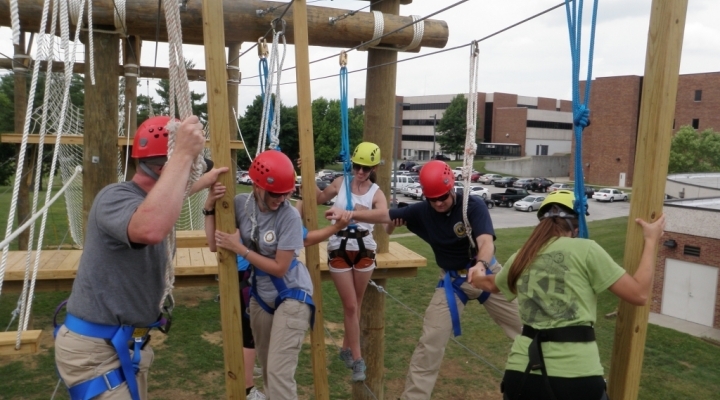 The EKU Challenge Course is a state-of-the-art facility where groups are given learning opportunities anchored in experiential education and the opportunity to move outside their comfort zone. 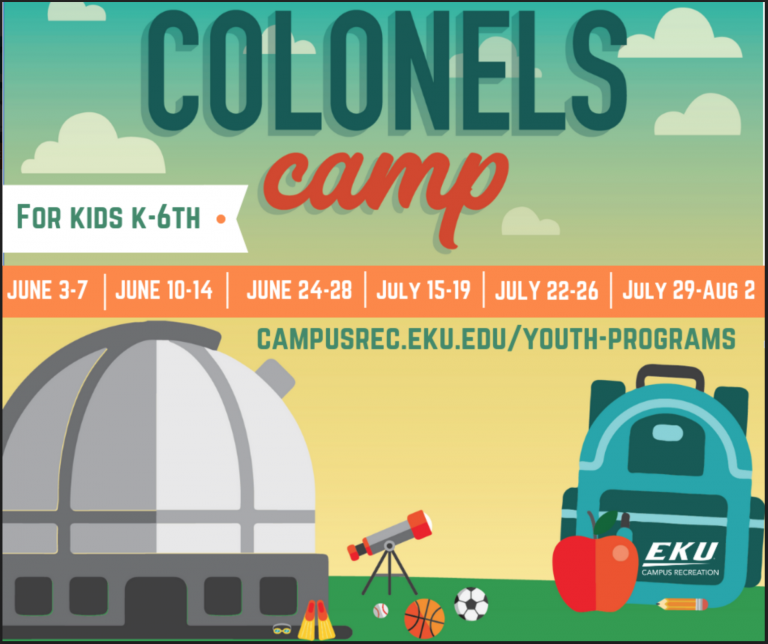 We offer a variety of programs and workshops to help you: Learn effective communication, build confidence, form relationships, understand the power of team, try new things, be adventurous, improve problem solving skills, gain trust, and most importantly Have Fun! 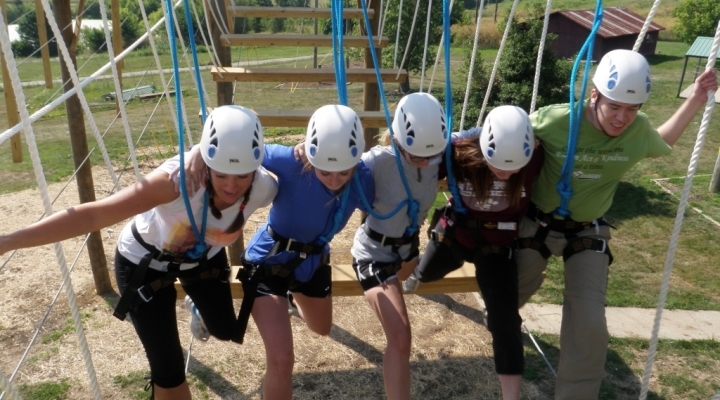 The Low Ropes Course which is designed with teambuilding and group cohesion in mind. This course features 13 unique elements that are close to the ground and require groups to effectively communicate and problem solve in order to complete the task. This course is great for adults and children 10+. 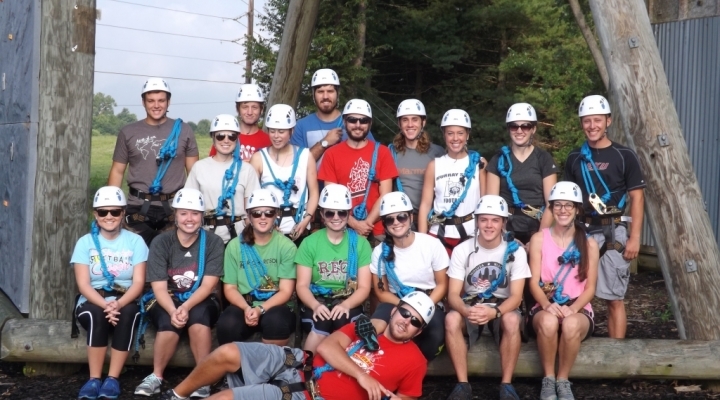 The low ropes course can take anywhere from 2-4hours and can comfortably accommodate a maximum of 50 participants. 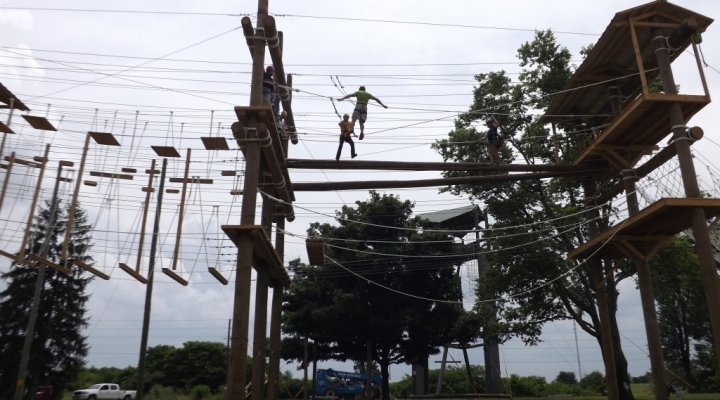 The Aerial Team Course (ATC) is the newest addition to EKU's course and is an amazing addition. This course allows groups to collectively conquer their fears, support each other and work cohesively as a unit to get through these new specifically designed elements. This course features two levels and at its highest is about 30 feet tall. 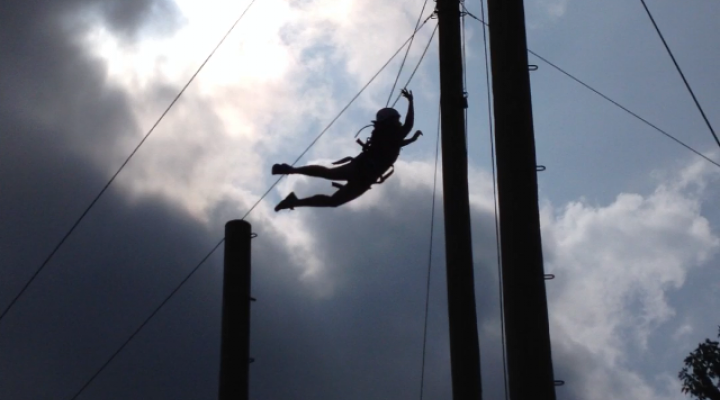 The ATC also offers 4 unique exit points: a Zipline across the lake, the breath taker swing, a Trueblue auto belay and a Quick jump free fall device. If you are looking for adventure and want to create a strong team this is the course for you. The ATC can take 4-8 hours depending on the size of the group and it can comfortably accommodate 40 participants. Participants much be at least 12 years old. 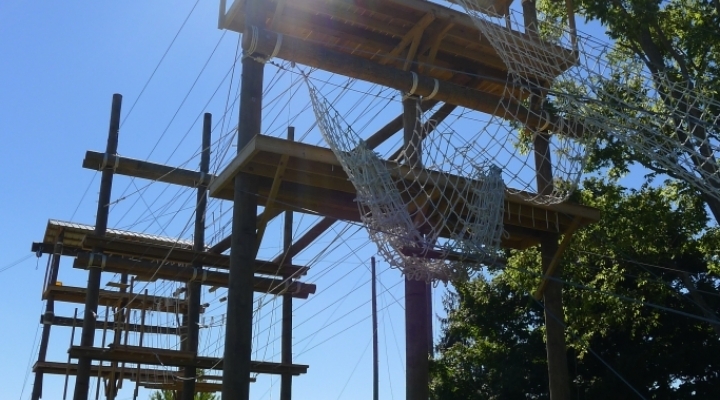 The Tango Tower is a self-contained high ropes course that has pair and individual free hanging elements, a rappelling area and one climbing walls. 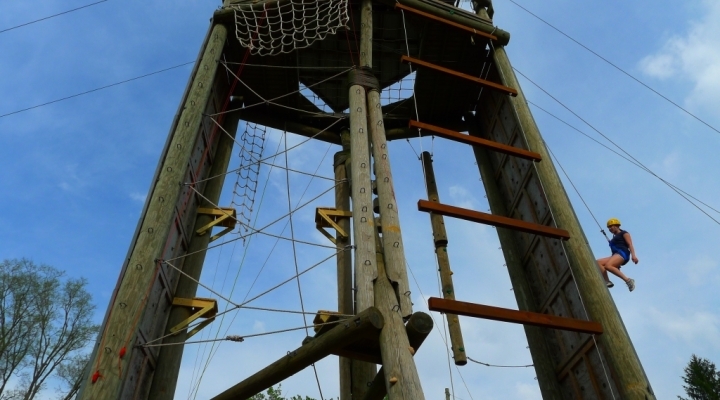 The Tower allows participants to conquer their fears and reach the top. The Tower is approximately 40 feet tall and can have up 6 people climbing at once. This course allows for groups to support each other from a distance and for certain groups the opportunity to metaphorically "put your life in someone else’s hands". This course takes 3-6 hours and can comfortably accommodate a maximum of 50 participants. Our course offers something for people of all fitness levels and a majority of our elements can be adaptable to accommodate certain physical limitations. Our facilitators are focused on safety and enjoyment of all our participants and encourage participation through a “Challenge by Choice” approach. Participants are encouraged to participate in all activities but neither our facilitators nor the group will force participants to do something that they are not comfortable doing. If you are interested in any of our facilities please feel free to give us a call and we will be happy to speak with you about our courses and tailor fit a challenge course program specifically for your group. 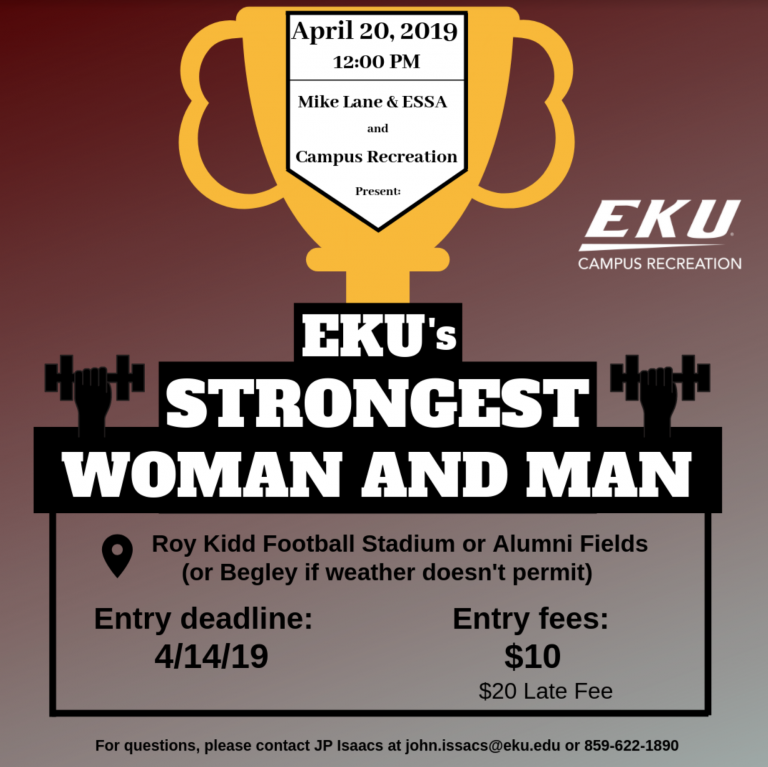 For REGESTRATION, quotes or questions please contact Ashley Turner at ashley_turner120@mymail.eku.edu or 859-622-5251.